The economic boom—and the devastation left in its wake—was writ nowhere as large as on the American West. Over the past decade, the most iconic of American landscapes has undergone a political and demographic upheaval comparable only to the opening of the frontier. In Desert America, a work of powerful reportage and memoir, acclaimed author Rubén Martínez explores a world of extremes: drug addiction flourishing in the shadow of some of America's richest zip codes, an exclusive Texas enclave that coexists with bloodshed on the banks of the Rio Grande, and Native Americans hunting down Mexican migrants crossing the most desolate stretch of the border. 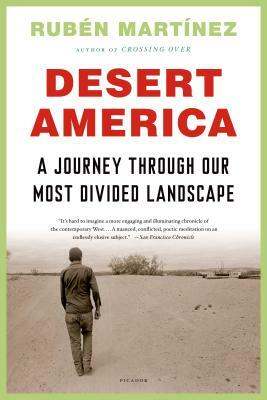 Desert America details Martinez's own love for this most contested region and reveals that the great frontier is now in the forefront of the vast disparities that are redefining the very idea of America. Rubén Martínez, an Emmy-winning journalist and poet, is the author of Crossing Over and The New Americans. He lives in Los Angeles, where he holds the Fletcher Jones Chair in Literature and Writing at Loyola Marymount University.